Garretson & Holcomb, LLC is devoted to meeting the needs of our clients efficiently and affordably. We consistently go above and beyond for our clients and will do the same for you and your family. Our primary practice areas are in domestic relations or family law and personal injury, but whatever your specific legal needs may be, we will find a way to help. Resolution is just around the corner — contact us today! We know there’s nothing you wouldn’t do to protect your loved ones. We take pride in helping you in your endeavor and are committed to fighting tirelessly on your behalf. We accept all domestic relations cases, including those pertaining to divorce, custody and support, and more. If you’ve been injured in a car or motorcycle due to the fault of a third party, hurt in a slip and fall, attacked by an out of control animal, or otherwise been injured due to the negligence of someone else please contact us to discuss how we may be able to help you file a personal injury claim. 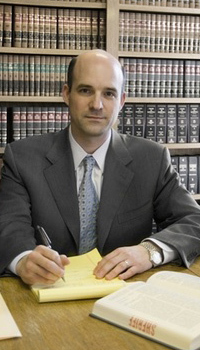 Attorney Jeff Holcomb is a highly-experienced attorney primarily focused on family law and domestic relations cases at the firm. He joined founding attorney John A. Garretson’s firm in 2006 after impressing him while representing the opposing party in a contentious divorce case.